The Federal Bureau of Investigation (FBI) is an agency of the United States Department of Justice that serves as both a federal criminal investigative body and an internal intelligence agency. The FBI has investigative jurisdiction over violations of more than 200 categories of federal crime. Its motto is "Fidelity, Bravery, Integrity", corresponding to the FBI initials. Excerpt: First Day 9:00 a.m. Call to Order Opening Remarks Roll Call Approval of Minutes from Last Meeting Adoption of Bylaws Topic #1 Standards Committee Report on Expansion of Current Audit Programs to Include Authorized Noncriminal Justice Agencies that have Direct Access to the Interstate Identification Index (III) Topic #2*. Excerpt: The meeting of the Compact Council was called to order at 9:00 a.m. on October 9, 2002, in the Vista Ballroom of the Wyndham Hotel, Washington, DC, by Compact Council Chairman Wilbur Rehmann. 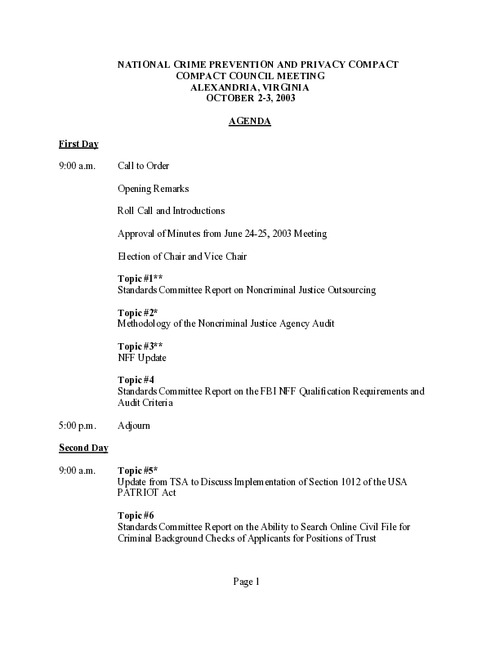 In Chairman Rehmann?s opening remarks, he noted that he had received three proxies for the meeting: Mr. Joe Bonino representing Mr. Frank Sleeter for the CJIS Advisory Policy Board, Mr. Michael Powers representing Ms. Diane Schenker, and Mr. David Yandell representing Lt. Cliff Daimler. Excerpt: The meeting of the Compact Council was called to order at 9:00 a.m. on October 10, 2000, at the Omni Shoreham Hotel, Washington, D.C., by Chairman Wilbur Rehmann. Chairman Rehmann welcomed everyone to the meeting and reflected on the Council's first year's accomplishments. 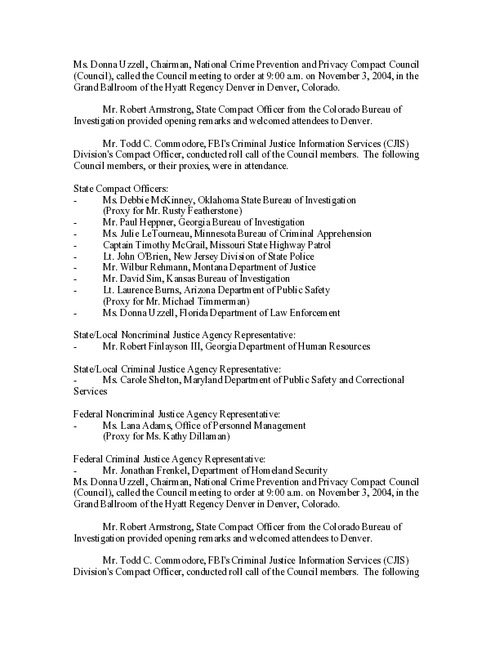 Excerpt: Ms. Donna Uzzell, Chairman, National Crime Prevention and Privacy Compact Council (Council), called the Council meeting to order at 9:00 a.m. on November 3, 2004, in the Grand Ballroom of the Hyatt Regency Denver in Denver, Colorado. 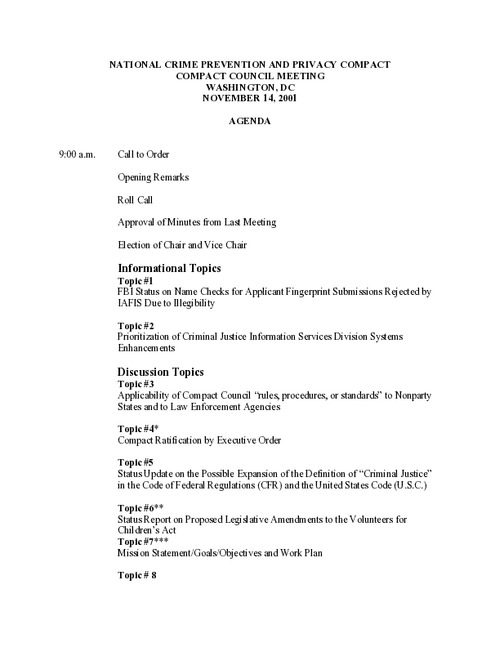 Excerpt: The meeting of the Compact Council was called to order at 9:10 a.m. on November 14, 2001, in the Franklin/McPherson meeting room of the Grand Hyatt Washington, Washington, DC, by Compact Council Chairman Wilbur Rehmann. Excerpt: Noncriminal Background Processing Survey Used to Gather Information on Practices, Policies and Workload VCA Survey Looked at Screening under Authority of Federal and State Laws 41 States responded. Excerpt: 9:00 a.m. Call to Order Opening Remarks Roll Call Approval of Minutes from Last Meeting Election of Chair and Vice Chair Informational Topics Topic #1 FBI Status on Name Checks for Applicant Fingerprint Submissions Rejected by IAFIS Due to Illegibility. Excerpt: AGENDA. November 17, 1999 9:00 a.m. Organizational Meeting Called to Order by FBI Representative Opening Remarks Roll Call and Individual Introductions Adoption of Bylaws BREAK Election of Chairman 10:30 a.m. Regular Meeting Called to Order by Chairman Election of Vice Chairman Discussion of Compact Council Mission and Responsibilities. 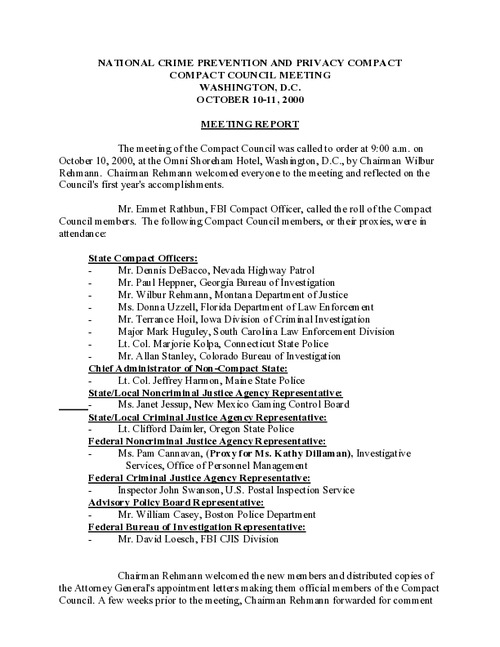 Excerpt: The inaugural meeting of the Compact Council was called to order at 9:00 a.m. on November 17, 1999, in Ballroom D of the Loews L?Enfant Plaza Hotel, Washington, D.C., by Mr. David Loesch, Assistant Director in Charge, FBI CJIS Division. Mr. Loesch welcomed all the members of the Compact Council and all the distinguished guests to the first meeting of the Compact Council.